Added pictures from this afternoon's Dale Devils v Buxton Hitmen KO Cup meeting. Pictures from the fun in the fog at Armadale as Edinburgh and Arena race 12 heats. All the comments on Keith Bloxsome have now been added to a single page. These include new comments from Tony McDonald (of Speedway Mail fame) and Rod Hunter, a former team mate of Keith's. SpeedwayLive.co.uk are offering to send score updates direct to your mobile. Each update will cost you 25 pence. Thanks to Andy for alerting us to a website dedicated to Milton Keynes Knights. It includes many pictures taken at the Groveway in the early eighties. Wimbledon's Gavin Hedge has a new website. It's hosted on the intheteam network and is maintained by Becky Partridge. Junior racer Lucas Hill has also launched a very impressive website. Keep up to date with his career at http://mysite.de/team-lucas. View pictures from tonight's Edinburgh v Hull meeting. Andy Taylor takes part in 'A Matter of Opinion' and tackles the Ben Howe, Middlesbrough and Boston situations. Regular visitor Mali Halls is a Mildenhall fan now exiled in Hastings. He's looking for an occasional lift up to Eastbourne meetings and will share costs. Drop us an email if you can help and we'll put you in touch. Paul Goodwin was a West Ham fan back in the sixties. He was saddened to hear of the recent death of Ken McKinlay and wrote to share a precious memory he holds of the great man. Read his tribute here. Ken Morgan has submitted his Newport Wasps Dream Team. He includes riders from the new era as well as those from the Sixties and Seventies. Photographer Graham Platten's photographs can now be viewed on the 'net. He operates mainly in the north and is track photographer at Berwick. View pictures from last night's Edinburgh v Sheffield clash. Amanda Booth has been in touch and said the following - " I would like to add to the debate about Keith Bloxsome. Whatever Andy Taylor or anyone else has said, one thing is for sure, they have got people talking about a rider many had forgotten. So perhaps Keith himself is having a little chuckle. My memories of Keith's is similar to Andy's, a rider who could have been so much better. I appreciate that he got injured during the 1985 season, but a rider who turns up for meetings with dirty equipment week after week really does reflect the unprofessional attitude that perhaps let him down and prevented him from ever reaching a good level in the sport. " Junior racer George Piper has now got a personal website. EnjayDesigns.com offers a wide selection of clothing and souvenirs. Keep up to date with the Stoke Spitfires at their new website - http://www.sps99.co.uk/spitfires/. Martyn Cornwell is in the chair in the latest in our 'A Matter of Opinion' series. He shares his thoughts on the development of the Conference League, the Green Helmet colour and the destination of the various league titles. Thanks to all who have registered to take part in this feature, you will all get your chance in the weeks ahead. David Spain followed the Ipswich Witches from 1985 until 1991. He returned to watch the sport last season and has submitted his Dream Team for us all to enjoy. Havvy's got a new website. You can find it at www.garyhavelock.co.uk. Glasgow fan Gary Sloss has launched a new online fanzine. Check out 'Easy Tiger' by clicking here. Speedway Star the sport's premier publication has finally got a web presence. So far it offers the chance to subscribe and to check out the fantasy league scores. Rowley Park in Adelaide staged Speedway from 1949 until 1979. The stadium is no more but the days of the bikes have not been forgotten. Check out these pictures courtesy of Mark Martin. Julie Griffiths is a Wolverhampton fan and has submitted her Dream Team. John Boynton on Keith Bloxsome - "Great reply Keith. As one of my boyhood heroes I'm pleased you've stood up for yourself. I had a quick look back through some programmes and books at how you did for the Diamonds during the 'great days' and you played a full part in our brilliant years of 1980-82." "For the record your average went from 3.5 - 4.00 at Boston to 5.0 at Glasgow up to 7.5 at Newcastle ( better than Tom Owen that year!! ); to me the same learning curve that any good rider would follow. I can only conclude that any criticism from Boston supporters is harsh and premature." "Thanks for all you did for Newcastle and all the best for the future." Action pictures from Berwick v Workington added. Andy Taylor on Tony Taylor's Dream Team - " I agree with your including Andy Hines. Andy was a good guy who always gave his all, he was well appreciated for his efforts for Boston as well.". Stewart on Hackney - I'm sure Hackney could draw enough support for Speedway racing if the team was called the Hackney Hawks and ran at 8pm on Friday nights. The Conference League offers the perfect low cost set up to test the water with a view to possibly moving into a higher set up at a later date. With Wimbledon making noises about moving up into the Premier League in 2004 Hackney could take over their London Conference League mantle. Also there's enough room in the Capital for another Greyhound racing set up. A lot of the Stadium facilities still exist and it would surely not cost as much as building a Stadium at a complete virgin site to reintroduce Speedway and Greyhounds. Berwick's new signing Carlos Villar has a personal website. The address is http://www.carlosvillar.8k.com/. Peterborough fan Tony Taylor has been watching the Panthers for over twenty years. His 'Dream Team' includes both riders from the present day and those that are long retired. Read it here. We're making it easier for you to get involved with the site. You can now submit your Dream Team or register to take part in 'A Matter of Opinion' by completing forms on the site. Links are available to the right of this page. What are you waiting for ? Wayne Hughes on Dudley Wood - "What a shame that the best speedway club in British Speedway has come to this. I hope Mr Pugh and Mr Bridgewater are proud of themselves to see a great club decline this way." Ben Hannon on Hackney - "This is terrible why can't someone restore it, this is embarrasing to think someone could do that." 1995 was a watershed year for British Speedway. Our flashback series looks at the some of the stories that made the news in March of that year. Action pictures from Glasgow v Workington added. Mark Ramsey is a fan of the Somerset Rebels and the latest supporter to feature in our 'A Matter of Opinion' series. Drop us an email at speedwayplus@hotmail.com if you'd like to share your views with our visitors. Romford Bombers were one of the numerous teams that enjoyed a short existence in the Sixties/Seventies. Find out more about the club by checking out http://www.romfordbombers.co.uk/. Simon Walker, of Swindon Sprockets fame, has a new website. It's a decent effort and full marks to the profile section for avoiding the usual cliched questions - favourite crisps etc. The URL is simonwalkerracing.co.uk. A new site has been launched that concentrates on the tracks in the South West. Fans of Exeter, Newport, Somerset and Trelawny should definitely check it out. Fifteen complete seasons have passed since the Canterbury Crusaders last took to the track. Sadly their Kingsmead Stadium is no more either. Click here to see how it used to look. Brian White has launched a new online shop selling goodies for riders and fans alike. They supply Wulfsport, UFO, Suomy, Nitro, Dirty Dog, Pro-Clean and have just become the U.K Distributor of Prexport Speedway Boots. The URL is http://ww.trackandterrace-shop.biz. Programme collectors may well be interested in a new site from Jaybee Programmes. The rechristening of the Kings Lynn side has caused a few problems for those with domain names that included the word 'Knights'. The official site was one of these, you can now find it at stars-speedway.co.uk. 17 year old Czech rider Lubos Tomicek has a new personal website. Visitors will find out that he is able to cook instant soup! Memorabilia collectors will enjoy a visit to the new Speedway Swap Shop website. No sign of Noel Edmonds but plenty of pictures of old badges and programmes. More stadia pictures courtesy of runtrackdir.com. These are of Isle of Wight Islanders home at Smallbrook stadium. A new Fantasy Speedway League with big prizes has been launched. The drawback is that there's an entry fee. Find out more at http://www.myspeedway.co.uk. "Brafield was first opened in September 1949 for midget car racing by Dave Hughes, a local baker. He owned a fleet of Skirrow midget cars and later raced them at many speedway tracks. It is now home to stock car racing and features most of the top formulas. It is promoted by Incarace." "Well not meant to offend Keith, there were so many good riders in the past that rode for Boston that it is difficult to remember many bad ones. However Keith I'm afraid I can't drive a tractor as I'm a townie. I too have had success in business successfully running my own catering business for many years before selling it for a handsome profit. I still watch the sport and in the past have provided some sponsorship to riders and hope to do so this coming season. It will be a young rider that will benefit though as I believe that too many young riders are lost to the sport due to a lack of funding. It really is a shame though after writing an interesting piece on life after speedway, that the article is finished with a sad stereotypical comment that people from Lincolnshire could find offensive." The famous Hackney Wick stadium is looking the worse for wear these days. Courtesy of our friends at runtrackdir.com we're able to bring you some rather distressing snaps of the famous London circuit. Click here to view them. John Strudwick takes part in the latest in our 'A Matter of Opinion' series. He gives his take on youth racing, 'doubling up' and the British League Cup. Drop us an email if you would like to take part in this feature. Most of the stadia pictures on this site are relatively modern, but here's one of real vintage. This is Marine Gardens in Edinburgh, the sport was staged there from 1928 until 1939. "Keith Bloxsome never pretended he was going to be a world beater, but in following the Kings Lynn stars for 20 years, Keith was one of the nicest blokes I ever met. I was sorry to see him leave the sport when he did. There have to be riders in this sport who are willing to lose a race or two or three, in the hope of winning the odd one, otherwise, we won't have a sport. Keith was one of those riders. Good on you Keith." Keith Bloxsome was astonished to find himself named in Andrew Taylor's Nightmare Team. Keith was a solid middle order scorer for a number of clubs in the seventies and eighties. Check out his response, and find out what he's up to these days, by clicking here. 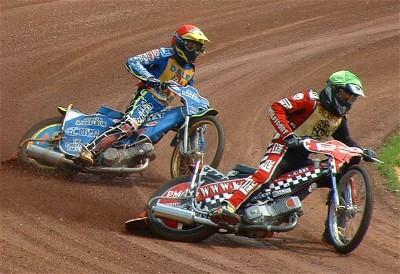 The initiative to reintroduce Speedway to Norwich is supported by a new website. Good luck to those involved. Peter Carr receives a 25-year testimonial this season. Keep up to date with 'The Motor' at www.motorists.foes.info. Mildenhall fans now have an additional website to check out. Find it at TheFenTigers.co.uk. Becky Partridge has started a second Wimbledon website. She also maintains one on the intheteam network. Very sad to hear that Scottish legend Ken McKinlay has passed on. 'Hurri Ken' appeared in nine world finals and was a non-riding reserve in another three. His career started at Glasgow in the immediate post-war years and didn't end until the mid 1970s when he was rider-coach at Scunthorpe. We pass sincere condolences to his family and friends. Swindon fan Steve Rayner is in the hotseat in A Matter of Opinion. 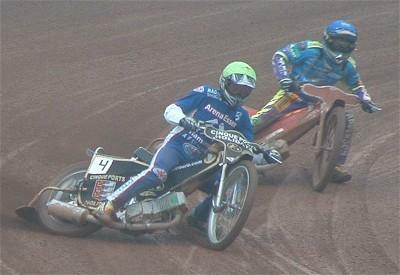 Leigh Adams' testimonial and Speedway websites are just two of the subjects under discussion. Drop us an email if you would like to take part in this feature. The new season must be just round the corner as new websites are springing up every day. The Back Straight is a new general site that features the latest news. Perhaps not different enough from existing sites at present but worth keeping an eye on. Speedway Village is a good source for basic historical information, such as lists of former National Champions. ChrisNeath.com is a nice looking site that contains everything you need to know about the Wolves and Swindon man. Luke Priest's new website is the place to keep up to date with the Sheffield Prowlers rider. There's also a picture of his brand new 2003 kevlars. New Islander Chris Mills has also got a new website. Typical stuff really with a profile, sponsors page and gallery. Graeme Paterson is the man behind Jamie Roberson's new site. Not quite finished by the looks of it but well presented. It's been a few years since we saw the Cleveland Bays in action but a new website has been set up in their honour. It's hosted on the popular intheteam network. Last but not least we must mention Emil Kramer's new website. He doesn't like Peterborough but he does like Pizza. Amazing what you can find out on the web these days. Ron McNeil used to present meetings at Milton Keynes, Middlesbrough and Bradford. His thoughts on the sport make for interesting reading in A Matter of Opinion. Ipswich Speedway Supporters Club have launched a new website to keep their members up to date with club activities. The URL is http://www.witchesfans.co.uk/.